AFSPA was formed following an informal reunion of largely Security Police/Air Police retirees held in Las Vegas, Nevada, in June 1986.
the laws of Texas. Headquarters was established in San Marcos, Texas. From its inception the Association determined it would not be limited to retirees but would be open to all who are, or had been, in the AAF Military Police, USAF Air or Security Police career field -- regular, reserve, Air National Guard, serving, served, or retired. 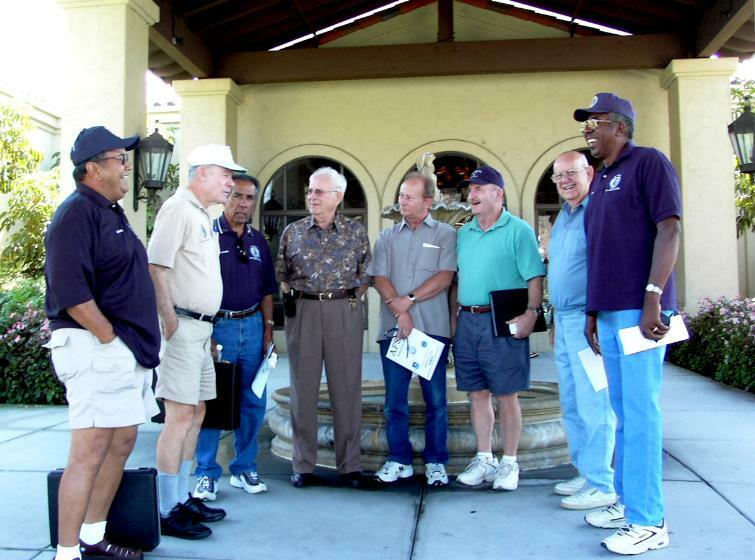 Since 1987 the association has held annually meeting. In 1995 it achieved a long-term goal of 2,000 members. The Ronald J. Terry San Diego Chapter. to people who are active or former members of all civilian law enforce- ment career fields. The chapter meets on the third Saturday of each month at Admiral Baker Field on the golf course Club House patio at 9:30 AM. Meetings last no more than one and a half hours. If you are a fan of the ancient sport of St. Andrews bring your golf clubs, in case a tee time is available. For more information, call: Tom Foster (760) 438-0643 or Allan Rappoport (858) 560-9255. Baker Golf Course Club House. More meeting pictures click here.